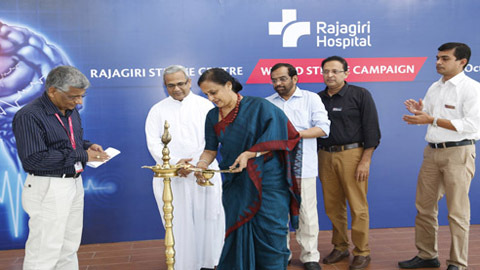 Alwaye : Industrialist Sheela Kochouseph Chittilappilly Inaugurated the Neurology Dept at Rajagiri Hospital, today. In connection with the World Stroke Day Dr.Gigy Kuruttukulam delivered a talk on "Stroke and Women".Rajagiri Hospital Executive Director, Fr.Johnson Vazappilli Stressed on the need of creating awareness on Neurological disorders. In Connection with the world stroke day , a three day medical Camp and awareness class under the guidance of Dr. Gigy Kuruttukulam and Dr.Jacob Chakko has also been organized. Around 300 people attended the Medical camp.